(Oregon Coast) – It runs 364 miles, from Astoria to Brookings, in a meandering, winding path along the ocean made of spotless sands, soaring, jagged cliffs, massive headlands and some places with a mixture of rocky slabs and soft beaches. It’s uncompromisingly unspoiled in many spots, while even plenty of those boast upscale civilization just steps away. The Oregon coast ignites the imagination in ways that plenty of other travel destinations in the U.S. do not. It’s a hot commodity in travel writing circles these days, and even hotter in the world of lodgings. Oregon coast hotels, motels, B&B’s and vacation rentals are doing brisk business, with the rental home industry going bonkers in an intriguing way. Meanwhile, Oregon’s coast is coming into its own as a destination for nightlife fun in many of these charming, heretofore quiet burghs. Increasingly, each town is digging deeper into its own identity and realizing more and more details and angles on what it has to offer. This guide takes you through the upper half of this always-surprising region, covering Astoria, Seaside, Cannon Beach, Manzanita, Rockaway, Tillamook, Oceanside, Pacific City, Lincoln City, Depoe Bay, Newport, Waldport, Yachats and Florence. 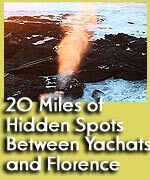 Links to further details such as Oregon coast picture tours, secret beaches, nightlife, dining, lodging and more are found everywhere here. For Astoria events, click here. The beaches begin at Warrenton, and from there until Tillamook Head in Seaside, it's miles and miles of sand. Gearhart sits prettily just north of Seaside, with its quiet, understated and very upscale presence that hosts some of the most amazing house architecture on the coast. The resort town of Seaside has entertained generations of northern Oregon residents. These days, you'll find the beautiful Promenade, the "million dollar walk" that's full of arcades, shops and delicious eateries, some stunning resorts, the Seaside Aquarium, and of course lots of beach wonders. For one: it's a little known fact the deserted northern beach has the most whole sand dollars anywhere on the Oregon coast. For extensive details about Seaside, see the Seaside Virtual Tour, Map. 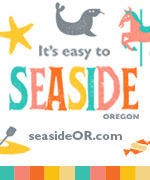 For Seaside, Oregon Lodging, click here. 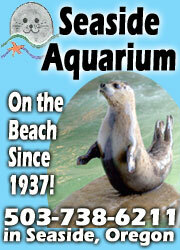 For Seaside events, click here. More pristine sands surround the charming, art mecca known as Cannon Beach. A plethora of art galleries, shops and eateries all adorned with cedar siding, and some of the most luxurious resorts on the entire coast make this place a unique visit. Ecola State Park includes great views of the mysterious Tillamook Head Lighthouse a mile offshore, a couple of secret beaches, and the surfers paradise known as Indian Beach. Just south of the town, there are a myriad of intriguing beaches as Highway 101 winds and twists above, showing off stunning viewpoints. 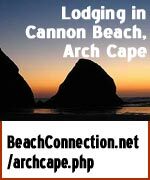 For extensive details about Canno Beach, see the Cannon Beach Virtual Tour, Map. 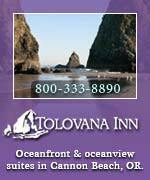 For Cannon Beach Lodging, click here. For Cannon Beach events, click here. South of Arch Cape and the tunnel, there are the awe-inspiring beaches and cliffs of Oswald West State Park, and then the highway takes you past brooding Neahkahnie Mountain and into Manzanita. There, the beach runs for miles until it dead-ends on the Nehalem Spit, where seal watching, hiking and horseback riding are de rigueur. 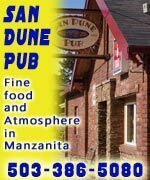 Manzanita has its very unique charms, with accommodations and eateries that are on the unforgettable side. Down the road you'll find the antique havens of Nehalem and Wheeler and the funky Nehalem Bay Winery. Quirky Wheeler is a clandestine treasure that hosts a wild, weird legend about supernatural coincidences that happen with tingling regularity. For extensive details about Manzanita, Nehalem, Wheeler and Rockaway, see the Nehalem Bay Virtual Tour, Map. For Nehalem Bay - Manzanita - Wheeler Lodging, click here. For Manzanita events, Nehalem Bay events, click here. Rockaway is a sleepy resort town surrounded by seven miles of barely-touched beach, with those colossal Twin Rocks lurking just offshore. Next, Garibaldi and Bay City sit right on Tillamook Bay, providing loads of fishing opportunities. Tillamook and the area surrounding it includes the enormous Munson Falls, Tillamook Air Museum, Tillamook Cheese Factory and the Bayocean Spit - about five miles of one big hidden beach (where you may find the remnants of a long gone ghost town). For extensive details about Manzanita, Nehalem, Wheeler and Rockaway, see the Nehalem Bay, Rockaway Beach Virtual Tour, Map. For Rockaway Lodging, click here. 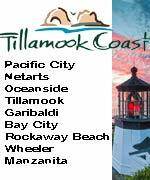 For Rockaway, Garibaldi and Tillamook events, click here. While 101 heads inland, the Three Capes Tour takes you to the wildly wondrous towns of Oceanside, Netarts and Pacific City; past Cape Meares and its lighthouse, Cape Lookout and its incredible views and trails, and through Cape Kiwanda and Pacific City's culinary and art wonders. Most of the time, this 25-mile stretch is full of awe-inspiring hidden spots. For more on the Three Capes Tour, Cape Meares, Oceanside, Netarts and Pacific City, see the Three Capes Virtua Tour, Map. 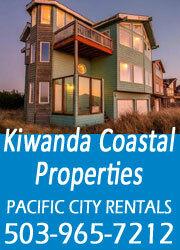 For Oceanside and Pacific City Lodging, click here. Just south of Pacific City you'll find the clandestine resort village of Neskowin and Cascade Head - both said to have some otherworldly spiritual qualities. For massive details on Neskowin in awe-inspiring Oregon coast pictures, see the Neskowin Virtual Tour. For Three Capes, Pacific City and Oceanside events, click here. This sprawling vacation central includes loads of immaculate beaches, a hopping club scene, some of the coast's finest restaurants, more motels than anywhere on the coast, the Tanger Outlet Mall and the natural splendor of Siletz Bay. There’s also a few secret beach accesses scattered throughout this otherwise crazed town. For extensive details about Lincoln City and other secret beaches, see the Lincoln City Virtual Tour, Map. For Lincoln City Lodging, hotels, motels and vacation rentals, click here. For Lincoln City events, click here. Probably the only town in the world with a spouting horn right downtown, it's also home to numerous cliff areas where views and exploration possibilities are nonpareil. Enjoy its proliferation of whale watch tours, the beautiful bridge with a ton of shopping opportunities and the world's smallest navigable harbor. See the Depoe Bay Virtual Tour, Map. To find Lodging in Depoe Bay, click here. For Depoe Bay events, click here. This is one enormous resort town, with an incredible array of beaches, funky rock structures and even two lighthouses. The Nye Beach district is so full of time warp charm you may explode, and the Historic Bayfront is home to a huge variety of fantastic restaurants and attractions. It's the home to two major aquarium attractions, several large, swanky hotels, a manmade tidal zone and hordes of clandestine beaches to the south. A few miles down the road, the weird formations and rocky remnants of fault lines cover the surreal scape of Seal Rock. For more details on Newport, Oregon, Nye Beach, Map To find Newport, Oregon Lodging, click here. For Newport events, click here. The sandy strands of tiny Waldport and the Alsea Bay eventually give way to the jagged basalt and wild surf of the village of Yachats. There's the ultra-convenient 804 Trail, where a one-mile, wheelchair accessible paved path snakes just above the dramatic shoreline. 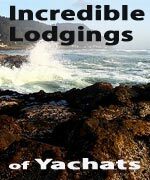 For such a small place, Yachats houses a remarkable number of amazing eateries. Just south of town, there's the towering Cape Perpetua and a host of hidden beaches where tide pools outnumber the humans. The world disappears here, with 25 miles of rugged places that boggle the mind with their primitive complexity and varied landscapes. See the Waldport, Seal Rock Virtual Tour, Map and the Yachats, Oregon Virtual Tour, Map. To see extensive details on that rugged, mysterious stretch between Yachats and Florence, click on the travel guide and Virtual Tour Map for Upper Lane County. For Yachats and Waldport events, click here. Florence sits halfway between the two borders of Oregon, and is the home to wild - even weird - wonders such as the Darlingtonia Gardens (insect-eating pitcher plants), a variety of fresh lakes in the midst of large dunes, miles and miles of immaculate sands, and the Sea Lion Caves. The purportedly haunted Heceta Head Lighthouse lays just north of town. With its nostalgic, slightly quirky Old Town and the beautiful bridge, Florence is also the gateway to the massive, 40-mile-long National Dunes Recreation Area. 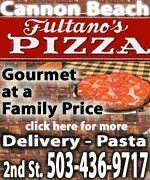 To see a massive tour of Florence, Oregon, click on the Virtual Tour and guide to Florence. For Florence, click here.